You want to enjoy your skiing holiday from the very first moment? Then you are in the right place at INTERSPORT Gruber & Wulschnig, base station Maibrunnbahn. You can receive the rental equipment of your choice without long periods of waiting with the support provided by the friendly staff at INTERSPORT Rent. Uncomplicated processes ensure that you can leave for the slopes faster than you might imagine! The INTERSPORT Rent team tries to optimize processes after your day of skiing: Thanks to the safekeeping in the depot of INTERSPORT Gruber & Wulschnig,base station Maibrunnbahn, you can abstain from annoying towing of equipment. 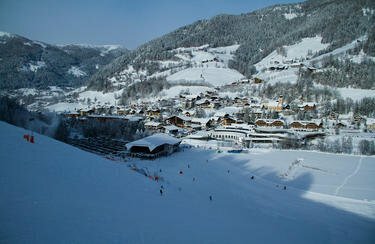 Just hand over snowboard, skis and boots directly in the ski rental in Bad Kleinkirchheim and start with warm boots and dry equipment in a new snow adventure the next day! Es hat alles wunderbar funktioniert! Echt begeistert war ich, als ich am Freitag bei der Rückgabe feststellen musste, dass wir mit der gesamten Ausrüstung zu spät für die Rückgabe dran waren. Ihr ward echt nett und habt unsere Sachen über den Hintereingang entgegengenommen und so hat für mich letztendlich doch noch alles wunderbar geklappt! - Dankeschön! Alles hat, wie immer, perfekt funktioniert! Sehr freundliche Mitarbeiter! Wir haben 1x Ski getauscht und auch hier gabs keine Probleme! Top! Danke!